Attracted by the progressively expanding hardware as a service market and underlying embryonic demand, many small and large scale enterprises are investing in hardware as a service hardware and services. Product innovation and upgrade of research and development are constantly taking place in the hardware as a service market. For instance, in July 2011, Navitas Credit Corp. introduced hardware-as-a-service (HaaS) offerings for managed service providers (MSPs) and channel partners. Prominent players identified in the hardware as a service market and profiled in the study include Navitas Lease Corp., Ingram Micro, Design Data Systems, Inc., ZNet Technologies Pvt. Ltd., FUSE3 Communications, and Microsoft Corporation among others. This comprehensive report titled Hardware as a Service Market -Global Industry Analysis, Size, Share, Growth, Trends, and Forecast, 2018 – 2026, by Transparency Market Research analyzes and provides growth forecast for the hardware as a service market at the global and regional level. In terms of region, the market has been classified into North America, Europe, Asia Pacific, Middle East & Africa, and South America. The report provides analysis for the period 2016–2026, wherein 2018 to 2026 is the forecast period and the base year is 2017. An in-depth and unbiased market assessment has been made to offer readers insightful and accurate analysis. The report emphasizes on all the major trends and services that play a key role in the expansion of the hardware as a service market between 2018 and 2026. It also focuses on market drivers, restraining factors, and opportunities of the hardware as a service market during the forecast period. The report includes a detailed ecosystem analysis and opportunity analysis, which is focused on providing an extensive view of the global hardware as a service market. Porter’s Five Forces analysis is also provided to understand the competitive scenario in the market. 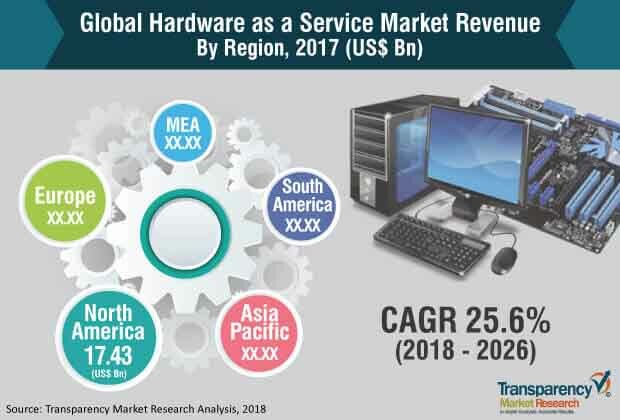 The study incorporates hardware as a service market attractiveness analysis, in which market segments such as hardware and services are benchmarked based on their market size, growth rate, and attractiveness in terms of opportunity. In order to provide a complete analysis of the overall competitive scenario in the hardware as a service market, attractiveness analysis of every geographic region mentioned in the report has been provided. An overview of the hardware as a service market detailing key trends and dynamics has been included to providea clear understanding of market ecosystem forces. The dynamics include impact analysis of market drivers, restraining factors, and opportunities of the hardware as a service market. Additionally, the report provides analysis of business strategies adopted by market leaders in the hardware as a service market. Trends and services related to hardware as a service systems along with their applications have also been explained in the report. The study provides a decisive view on the global hardware as a service market, broadly segmented based on component into hardware and professional services; based on hardware model into Platform as a Service, Desktop/PC as a Service, Infrastructure as a Service, and Device as a Service; based on deployment into cloud and on-premise; based on enterprise size into small & medium enterprises (SMEs) and large enterprises; and in terms ofindustry verticalinto BFSI (banking, financial, services and insurance), IT and telecom, government, healthcare, education, legal, construction, manufacturing, and others. Further, the report provides a detailed breakdown of the hardware as a service market across geographic regions, which include North America, Europe, Asia Pacific, Middle East & Africa, and South America, thus providing valuable insights at the micro and macro levels. The report highlights the competitive scenario within the hardware as a service market, ranking all the major players according to key recent developments and their geographic presence. The insights into the hardware as a service market are a result of our extensive primary interviews, secondary research, and in-house expert panel reviews. These market estimates have been analyzed by considering the impact of different economic, political, social, legal, and technological factors. The market in North America has been segmented into the U.S., Canada, and Rest of North America. Furthermore, the market in Europe has been analyzed across France, Germany, the U.K., and Rest of Europe. The hardware as a service market in Asia Pacific has also been segmented at country level into China, Japan, India, and Rest of Asia Pacific. The Middle East & Africa region covers GCC countries, South Africa, and Rest of Middle East & Africa. Similarly, South America includes Brazil and Rest of South America. This report provides all the strategic information required to understand the hardware as a service market along with component, hardware model, deployment, enterprise size, and industry verticals. Primary research involves telephonic interviews, e-mail interactions, and face-to-face interviews for detailed and unbiased reviews of the hardware as a service market across geographies. Primary interviews are usually conducted on an ongoing basis with industry experts and participants in order to obtain the latest market insights and validate existing data and analysis. Primary interviews offer new and fresh information on important factors such as market trends, market size, competitive landscape, growth trends, etc. These factors help validate and strengthen secondary research findings. Moreover, the data collected and analyzed from secondary and primary research is again discussed and examined by our expert panel. The research study includes profiles of major companies operating in the global hardware as a service market. Market players have been profiled in terms of attributes such as company overview, financial overview, business strategies, and recent developments. Parameters such as investment and spending and developments by major players of the market are tracked. Some of the key players in thehardware as a service market are Navitas Lease Corp., Ingram Micro, Design Data Systems, Inc., ZNet Technologies Pvt. Ltd., FUSE3 Communications, MasterIT, LLC, and Microsoft Corporation among others.